There seems to be no end of superyachts coming on the market as Andrew Cosgreave at Northrop & Johnson sends word that he's listed the 32.2m motor yacht The Lady J for sale. Built by Heesen in 1988 as a 27.4m yacht she was subsequently lengthened to 32.2m and had a complete interior refit. Constantly upgraded over the years, The Lady J has a stellar charter history, accommodating up to nine guests in a master suite, VIP stateroom and two twin cabins. 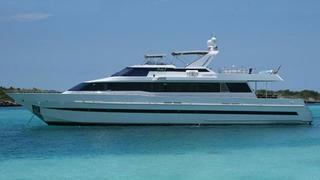 Twin 1080hp GM engines give her a range of 1,260 nautical miles at 14 knots. The Lady J is asking $1,800,000.